There is nothing better than nourishing your body while indulging in delight! Casa Luna handcrafts their chocolate bars with quality ingredients, infusing their treats with anti-oxidants to boost your health. They are also unique as they add cannabidiol (CBD) so patients can doubly enjoy their medicine. Casa Luna controls every aspect of production, from the cocoa bean seed to the final product. The chocolate is 100% organic and made with kosher certified ingredients. Grown on family-owned small farms, the cocoa bean goes through a process of fermenting, drying, and roasting to release the chocolate’s flavors. 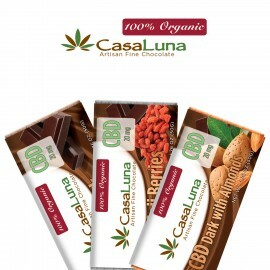 A wide assortment of Casa Luna chocolate bars are available at Outliers Collective. Super foods (such as Goji Berries, Maca, and Pomegranate) are infused in the chocolate for an added health boost. Vegan and sugar free chocolate is also available.